This is the N Page of our A to Z guide to plants -- how to care for them, landscaping with them, and cooking and healing with them. 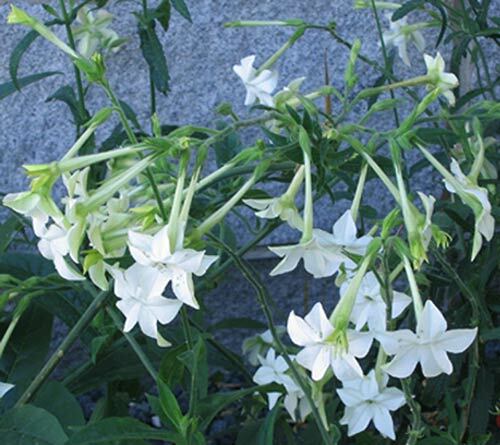 This is one of my all time favorite flowering plants and its success in my garden has eluded me for years. Does it need water or not, fertile soil or not, sun or not? I am too frustrated for words by this engaging plant which I have been unable to grow. 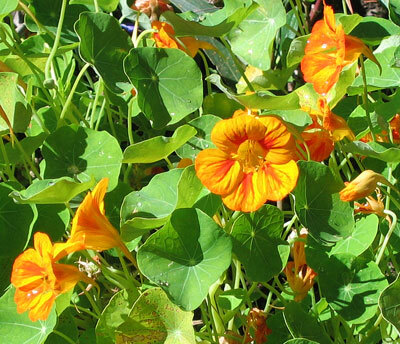 Nasturtium flowers, leaves and seeds are all edible and all impart a peppery flavor to the foods in which they are used. The plant's flowers are attractive to butterflies and hummingbirds. 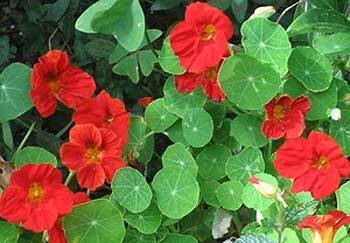 Nasturtiums are high in vitamin C and have had medicinal uses in traditional medicine. Planting and Care: In my last foray onto the internet in search of yet another way to get this plant growing I found the latest information. 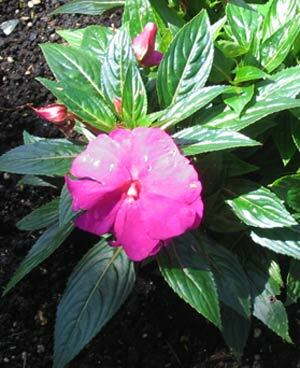 Plant them in full sun in an area of the garden that holds moisture in the soil. I'm going to give that a try. This is a lovely tree with deep green soft leaves as you can see in the photograph to the left. It seems a very pliant tree with soft branches growing hither and yon which makes it ideal in the Caribbean where we routinely had ferocious winds. Benefits: We used the leaves as an organic insecticide in our vegetable patches. We crushed the leaves and set them to soak for three days and then used the liquid as a spray. Insects do not like it as all of them fly up and off the plants when we spray and the plants always look better the next day. We have been told that farm animals on the island will not eat the neem’s leaves, not even the goats, and it is almost unimaginable that there is something they won’t eat. Apart from its agricultural applications, neem trees have been used for centuries in traditional medicine. No doubt you have also heard of its beneficial cosmetic qualities. 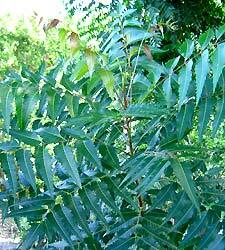 From: The neem is native to India, Nepal, Pakistan, Bangladesh, Sri Lanka, and the Maldives. Planting and Care: At its best a neem tree may reach a height of more than 100 feet. It is a fast growing tree happiest in a year round warm climate. It is not fussy about garden conditions, but it does love being in full sun. It is flexible about soils as well, but as with most plants the better the soil, the better the plant. Routine rainfall is beneficial, but waterlogged soil is very detrimental. 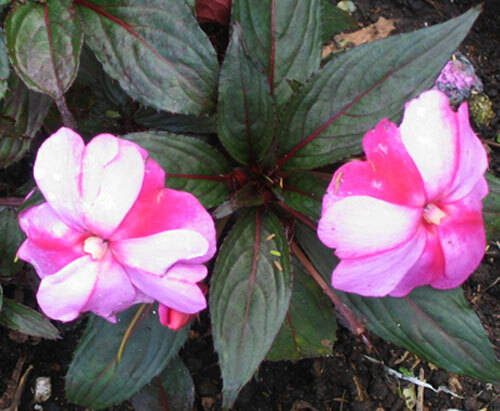 These are striking foliage plants that actually also flower making them doubly attractive. All told they'll grow to be less than 2 feet tall. Photographed: On the right at the Winter Garden in Auckland, New Zealand in 2013 and on the left at the Hotel Atitlan on Lake Atitlan in Guatemala in 2010. 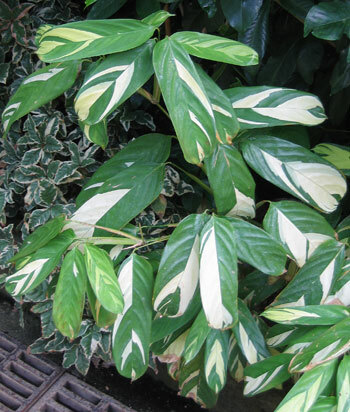 Planting and Care: These are shade plants that do well in warm, moist or humid climates with a fair amount of rainfall or watering. Along with those requirements, give them a moderately rich composted soil and they'll be very content. 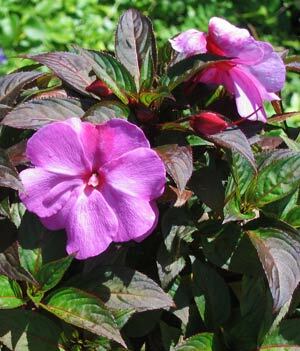 I think this is a great improvement on the old standby impatiens plants. The leaves are colorful and the same small sized blossoms come in more brilliant colors as well. If you have a shade garden, I would very much recommend a few of these plants. Benefits: In this family of plants, some have been used in traditional medicines and one is used today as a Bach Flower Remedy, though it is not one of those pictured here. 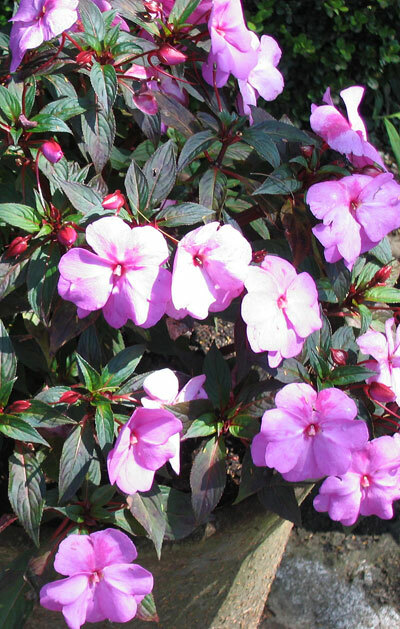 Planting and Care: Treat your impatiens as annuals planting them in well-draining moist soil in shade or even in deep shade. It is important that they receive regular rainfall or watering to be at their best. Maybe the most demanding feature of this plant is warmth. It will not handle frost or cold weather. Benefits: The flowers are extraordinary and maybe that's enough. Photographed: In the Botanical Garden at the Hotel Atitlan on Lake Atitlan in Guatemala in July of 2010. Planting and Care: Oddly, the New Guinea trumpet vine flowers on old wood so take great care with any kind of pruning until you have experience with this vine. This is a fast grower and loves to find support on a trellis or something similar. 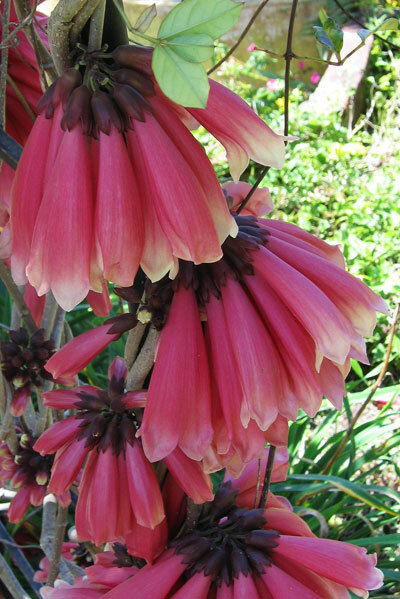 As a tropical plant it does best in warm, moist fertile soil in a semi shady situation or in one where it does not have to suffer mid-day direct sun. Be sure it receives regular rainfall or watering. With my appreciation, my #16 Vine mystery was identified for me by 'Botanics Man' on Twitter. I think of this often coppery colored plant as a type of wide bladed grass. It is very appealing even when it is entirely green. 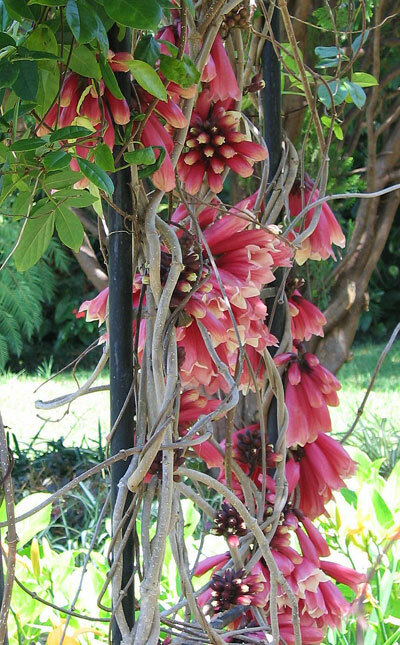 Benefits: Many years ago the Maori used this plant in finely and beautifully woven textiles. The leaves were also used in the production of baskets and even fishing nets. 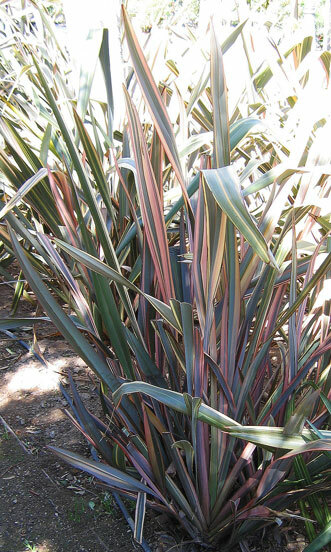 Not surprisingly, the Maori also found the many medicinal benefits of New Zealand flax. Soon after the arrival of the British the wonders of this plant material became evident and the Maori were enslaved to produce it great quantities for export. 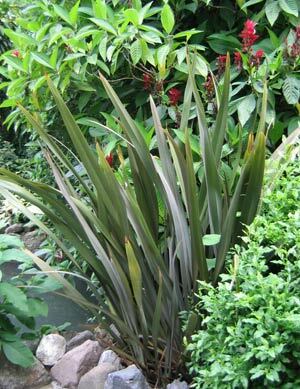 Planting and Care: At its best in your garden New Zealand flax will grow to be 4 feet or more in height. It is a perennial plant in warm tropical regions, but you can enjoy it in colder places if you shelter it for the winter season somewhere in your home someplace close to a sunny window. New Zealand flax likes to live in moist fertile well draining soil in full sun though depending on your location it will appreciate shade from the hot afternoon sun. Photographed: In the city gardens in Malaga, Spain, 2012. Many years ago I grew these flowers in my New England summer garden. The scent in the late afternoon was glorious. 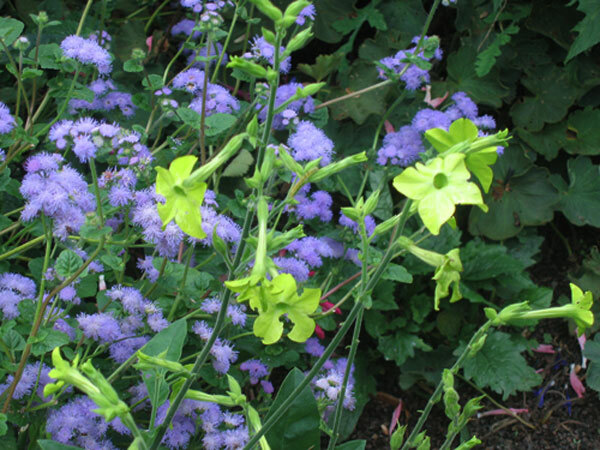 I found the lime colored variety in the photograph below especially interesting for the color combinations it could make with other flowers in an informal summer garden. Photographed: On the right in the Thuya Garden, Mt. Desert Island, Maine, 2013. 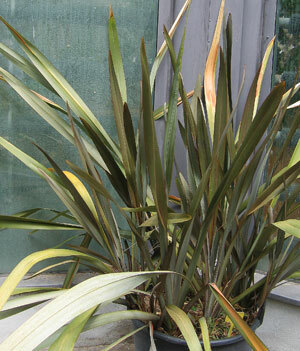 Planting and Care: These are very easy to care for plants. Give them warm summer sunshine and regular watering or rainfall and they will do just fine. They are annuals so in a cold climate you will have to plant them each year. Noni, Great Morinda, Beach Mulberry, Indian Mulberry Morinda citrifolia L.
These are beautiful green bushy plants and trees that to a novice tropical gardener like me seem very desirable. From: Southeastern Asia or maybe the Caribbean or maybe Hawaii. 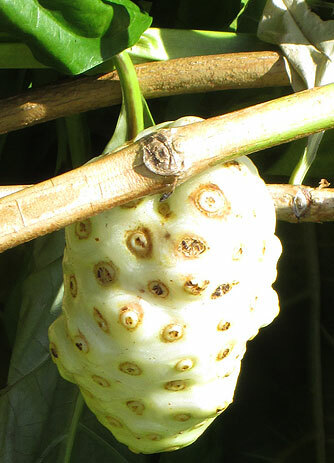 Planting and Care: Plant your noni in the sun or in a semi shady area where it will benefit from local rains, even though it will handle a drought if it has no choice. Nutmeg Tree Myristica fragrans Houtt. In a sunny, warm, humid place the nutmeg tree will grow to 70 or 80 feet. 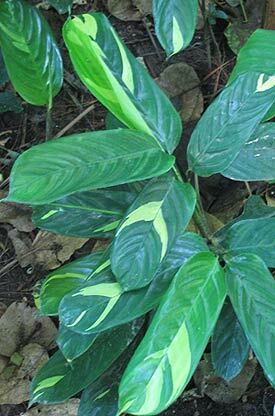 Its leaves are similar to those on a coffee tree or gardenia–deep green and shiny. Five to six months after flowering it bears a 2" fruit containing the nutmeg seed. The seed is covered with a scarlet aril which when dried and ground becomes mace. One hundred nutmegs will produce only 3 ounces of dried mace. It has become an important export crop for the island of Grenada which sends about 2000 tons of nutmeg to the US each year. Benefits: It is said to have medicinal uses as well as giving us its terrific spice. Imagine eggnog without it! From: Opinions vary on its origin; some say it is native to the East Indies while others believe that nutmeg arrived in the Caribbean in the early 19th century.